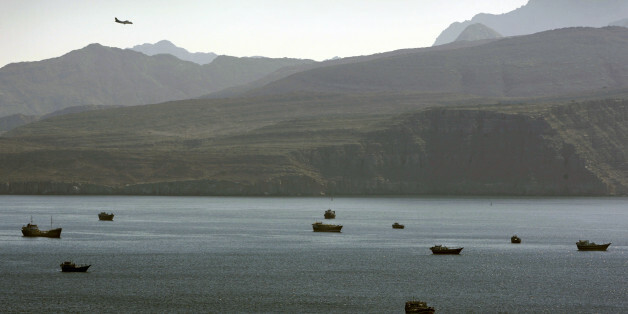 DUBAI/WASHINGTON, April 28 (Reuters) - Iranian patrol boats intercepted a cargo ship in the Strait of Hormuz on Tuesday and forced it into Iranian territorial waters by firing shots across its bow, prompting the U.S. Navy to send a destroyer and reconnaissance plane to monitor the situation. Iranian Revolutionary Guard boats confronted the MV Maersk Tigris, a Marshall Islands-flagged vessel, as it was traversing one of the world's most important oil shipping channels and forced it to divert toward Larak Island near Bandar Abbas, where it was boarded by Iranian forces, U.S. officials said. The Iranian action occurred amid heightened tensions over the conflict in Yemen, where a Saudi-led coalition supported by Washington has been bombing Iranian backed Houthi rebels, who have seized much of the country and sidelined the U.S.-backed president. Saudi jets bombed the airport in Yemen's capital on Tuesday to prevent Iranian planes from landing. The ship seizure also came at a sensitive time as Tehran is inching toward a final deal with major powers on its nuclear program. The Maersk Tigris, which is managed and crewed by Rickmers Shipmanagement, is on-hire to Maersk Line. Alerted by a distress call from the Maersk Tigris, the U.S. Navy dispatched the destroyer USS Farragut toward the scene as well as a reconnaissance aircraft, the Pentagon said. Army Colonel Steve Warren said firing shots across the bow of a cargo vessel was "inappropriate" and seemed "provocative." The incident came just four days after Iranian patrol boats surrounded a U.S.-flagged vessel, the Maersk Kensington, and followed as it was in the same area, a U.S. official said. No warning shots were fired in that incident. Iranian officials sought to play down the ship seizure, saying it was a civil matter with no military or political dimension. But the United States has responsibility for Marshall Islands security and defense under a Compact of Free Association with Washington. U.S. officials were looking into Washington's obligations to the Pacific Island nation under the accord. Reuters tracking data showed the Maersk Tigris, a 65,000-tonne container ship, anchored off the Iranian coast between the islands of Qeshm and Hormuz. It had been listed as sailing from Saudi Arabia's Red Sea port of Jeddah, bound for the United Arab Emirates port of Jebel Ali in the Gulf. Iran's state news agency, IRNA, quoted a source in the Islamic Revolutionary Guards Corps (IRGC) as saying the guard had seized the vessel and 34 crew. Rickmers said there were 24 crew, mostly from eastern Europe and Asia. The IRGC is Iran's elite military force and operates its own land, naval and air forces under a command chain separate from the regular armed forces. Mohammad Saidnejad, head of Iran's Ports and Maritime Organization, said a court in Tehran had given the order to seize the ship. "A legal complaint from an Iranian private company resulted in the seizure of a Marshall Islands-flagged ship in Iranian waters," Saidnejad was quoted as saying by IRNA. The incident was unlikely to derail efforts by the United States and five other powers to secure a final nuclear deal with Iran, even though it was likely to stoke further opposition in the U.S. Congress, risk consultancy Eurasia group said. Under the proposed nuclear accord, Tehran, which denies seeking to build nuclear weapons, would win sanctions relief in return for slashing the number of its uranium enrichment centrifuges and accepting intrusive international inspections. "We believe the U.S.'s and Iran's top priority, by far, is to secure a deal on the nuclear issue, and that the sides will likely resolve this issue quickly," Eurasia's Cliff Kupchan said. The seizure may have been a response to the U.S. placement of ships off Yemen to prevent Tehran from sending arms to Yemeni Houthi fighters, he added. Iran denies arming the Houthis. A spokesman for the Singapore-based Rickmers Shipmanagement, Cor Radings, said he did not know why Iran had acted. He said Iranian forces fired warning shots near the container ship and boarded it. He said the company was concerned for the crew. A U.S. government official said the ship was intercepted at 0905 GMT. The closest U.S. warship, the USS Farragut, was more than 60 miles (100 km) away, he said. Some 17 million barrels per day (bpd), or about 30 percent of all seaborne-traded oil, passed through the Strait of Hormuz in 2013, according to the U.S. Energy Information Administration (EIA). Iran has in the past sometimes threatened to block the strait to advance its opposition to sanctions imposed over its nuclear program.